This is the kind of place the locals actually play. The kind of place that offers regular Sunday champagne brunches and New Year's Eve parties in the clubhouse. Mesquite's low green fees bring them in (under $100 even in Palm Springs' ultra expensive peak season). Its mountain backgrounds and golf along the bottom of a streambed are what bring them back. 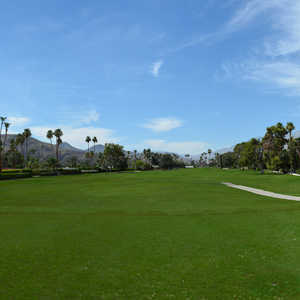 Mesquite Golf and Country Club in Palm Springs isn't a long course by any stretch of today's standards. It comes in at 6,312 yards from the back tees. Locals find that fits just right. Again, it's Palm Springs. Many of the locals are cashing retirement checks between drives. A little shorter does not necessarily mean uninteresting though. There are eight small lakes out on Mesquite and when the water's running in the stream it plays with some kick. At the same time, it's very friendly to women, seniors, anyone who finds distance to be a challenge. The 366-yard par-4 ninth is illustrative of a course that regularly lets average hackers go for the green.